CellMosaic has designed this kit for antibody (IgG) labeling of monomethyl auristatin F (MMAF) with maleimidocaproyl linker (Mc) (a stable linkage). MMAF is a new antimitotic auristatin derivative with a charged C-terminal phenylalanine residue. The kit includes maleimide-activated MMAF (Mc-MMAF), which can be coupled directly to the antibody after reduction through alkylation in a single step (a method developed by Seattle Genetics: Sun et al. 2005, Bioconjugate Chem. 16, 1282-1290). The product is purified to remove any unreacted drugs. This kit provides materials to conjugate MMAF onto one (CM11422) or three (CM11422x3) antibody samples (IgG only). Scale of the reaction: 3 mg. Shipping policy: Heat sensitive and ship with cold packs, choose overnight (ships Mon.-Thur.) or 2-day delivery (ships Mon.-Wed.) at checkout. Mechanism of action: Inhibits cell division by blocking the polymerization of tubulin. Activities: Antioxidant, anti-inflammatory, anticancer, and insecticidal activities. Selected References: 1) Doronina SO, Mendelsohn BA, Bovee TD, et al. Enhanced activity of monomethylauristatin F through monoclonal antibody delivery: effects of linker technology on efficacy and toxicity. Bioconjug Chem 2006;17: 114–24. 2) Polson AG, et al. Antibody-drug conjugates for the treatment of non-Hodgkin's lymphoma: target and linker-drug selection. Cancer Res. 2009;69(6):2358−2364. After conjugation: you can choose to send your sample to CellMosaic for HPLC analysis and calculation of the DAR. In this kit, the target DAR is 3-4. Depending on your antibody, you may achieve a lower DAR. Unfortunately, Mc-MMAF doesn’t have a characteristic UV absorbance that allows easier calculation of DAR by UV. 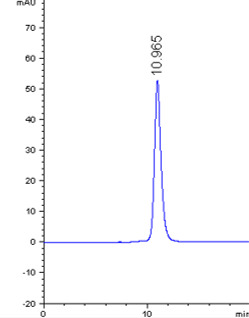 For DAR calculation and to check the homogeneity of the ADC, you can analyze it by hydrophobic interaction chromatography (HIC). If you do not have access to such a facility setup, you can send your sample to CellMosaic for analysis. Mc-MMAF is very hydrophobic. This kit is designed to minimize the aggregation and precipitation issues generally seen with MMAF labeling. However, you may still notice some solid precipitate out or ADC aggregation during the reaction. The precipitate will be removed during purification. Depending on the properties of your antibody, recovery will be 40-80%. If you are concerned with the aggregation, you can use size exclusion chromatography (SEC) to check the extent of aggregation. If you do not have access to such a facility, you can send your sample to CellMosaic for analysis. Recommend storage at 2-8°C for short-term. Do not freeze in PBS buffer. Based on our preliminary data, the conjugate made with this kit can remain stable in PBS buffer at 2-8 °C for few days. You may notice the increase amount of the aggregation after storing for sometimes. 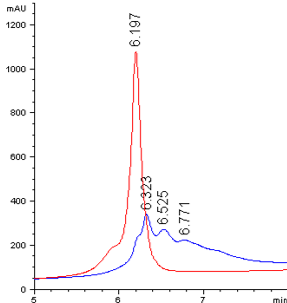 The stability of your conjugate may be different due to your antibody and should be checked either by HPLC or UV. If you need to store the ADCs for long term, please dilute your ADC in Stabilization PBS buffer (5x). Aliquot and store the conjugate in a < -20°C freezer or lyophilize to dryness. Avoid repeated freeze and thaw cycles. If the ADC is in a lyophilized powder, after dissolving, the solution should be used within few days. CellMosaic’s proprietary ADC stabilizing PBS buffer (5x) contains 5x PBS buffer and other stabilizers to prevent the hydrophobic drugs from interacting with each other during storage and causing the ADCs to precipitate out. Stabilization buffer also helps preserve the structure of the ADCs during lyophilization. The buffer is biocompatible and can be used directly for any in vitro and in vivo studies. For more information on the stabilization buffers, please check our website. 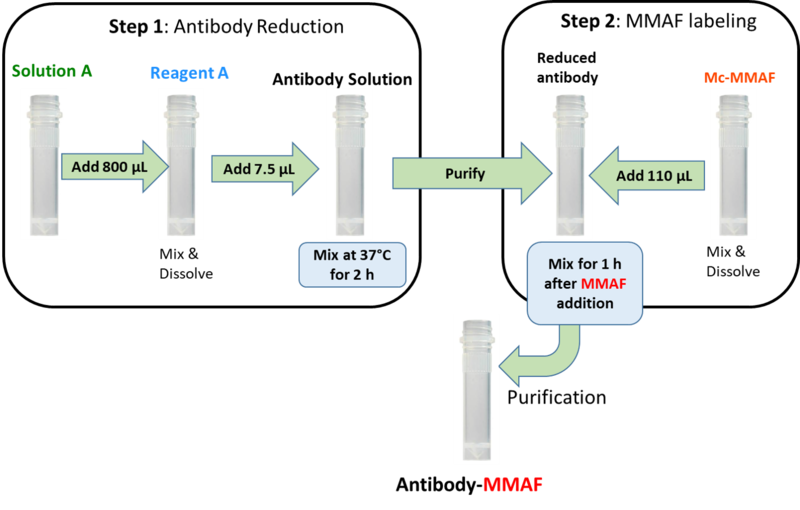 1) Dilute your un-conjugated antibody to 1 mg/mL in PBS buffer, then transfer 50 μL of the diluted solution to a 500 μL microcentrifuge tube. Label the vial properly. 2) Transfer 50 μL of ADC (non-diluted solution) to a 500 μL microcentrifuge tube and label the vial properly. 3) Ship your samples with a cold pack for overnight delivery. Click the button below to add the Antibody Mc-MMAF Conjugation Kit to your wish list.